NETWORK UPDATE: The NHL FINALS rating adjusted up 0.1 to 1.9 in final numbers, tying last year’s Game 1. In addition, MASTERCHEF rose 0.1, as did the rerun of SUPERNATURAL. CABLE HIGHLIGHTS: A busy but not particularly high-rated night was topped by BET’s season premiere of THE GAME at 0.67, with lead-out FRANKIE & NEFFE at 0.41. HGTV’s BROTHER VS BROTHER was the #2 cable original at 0.64, with lead-0uts HOUSE HUNTERS at 0.58 and HOUSE HUNTERS INTL at 0.47. Cable sports was led by ESPN’s COLLEGE SOFTBALL WORLD SERIES coverage at 0.61. Fox News made an unusual appearance in the day’s top 10 with THE KELLY FILE’s interview with the Duggar parents in the midst of their family scandal, putting the show at 0.60. History’s AMERICAN PICKERS dropped 0.09 to 0.52. 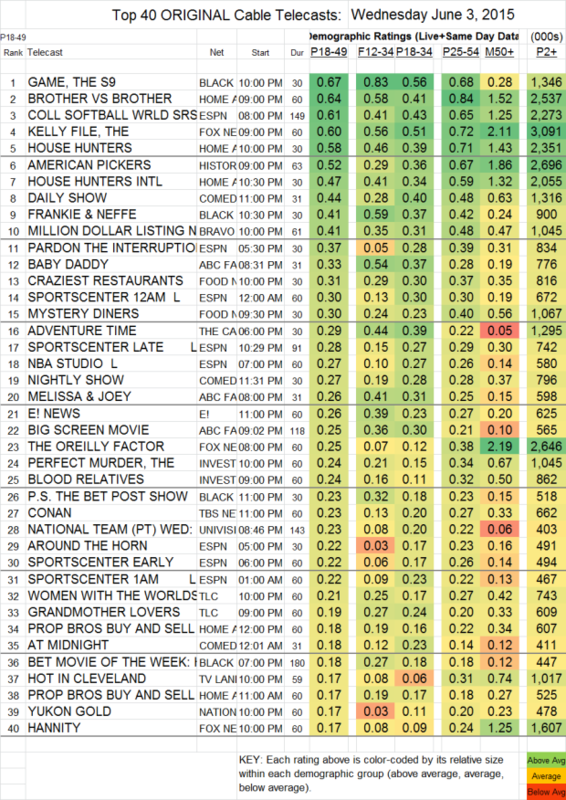 MILLION DOLLAR LISTING (Bravo) was down 0.04 to 0.41. On ABCFamily, the season premiere of BABY DADDY was at 0.33, and the final season premiere of MELISSA & JOEY was at 0.26. The series finale of HOT IN CLEVELAND on TV Land was up 0.06 to 0.17, with an airing on Nick Jr at 0.02/51K. INSTANT MOM was steady at 0.10 on TV Land only. In between the two, the network ran a “sneak” of the pilot for its upcoming THE JIM GAFFIGAN SHOW, and earned a 0.09 rating in 18-49s, with 430K total viewers. On VH1, SWAB STORIES rose a hundredth to 0.13, and WALK OF SHAME SHUTTLE fell 0.03 to 0.07. Below the supplemental chart, RIPPER STREET gained 0.02 to 0.05 with 238K total viewers, and on POP, QUEENS OF DRAMA (POP) climbed 0.03 to 0.05 with 157K total viewers, and UNUSUALLY THICKE was up 0.02 to 0.04 with 110K total viewers. There was some interest in the new line-up on DAM, although RING OF HONOR, which was described to us as a new show, is listed as a rerun, so perhaps someone can clarify for us. In any case, at 8PM it had a 0.04 18-49 rating, with 163K total viewers, and another run (or episode) listed without a start time was at 0.03/110K. IMPACT WRESTLING ran a new episode at 9PM at 0.09/297K (down 0.03 and 116K total viewers from last Friday’s episode), which also aired at midnight with a 0.02/72K result (down 0.03/85K from the last Friday re-airing).